Fort Wayne – Flour bags will go flying on Thursday, July 18 in Lawton Park for the annual “Catapult Chaos” sponsored by Fort Wayne’s Science Central and Fort Wayne Metals. 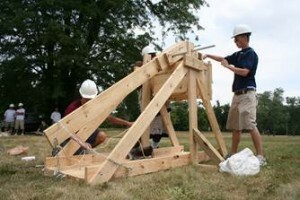 Beginning at 1 p.m., teams will showcase their catapults and trebuchets. They will blast the packages into the sky in an attempt to obtain the longest distance. Water balloon activities for children will also be available at the event, which is free and open to the public. Science Central, a not-for-profit 501(c)3 organization, has provided a hands-on fun learning environment for over 17 years. Through our 120+ exhibits, school tours, distance learning programs and weekend public events, we bring the excitement of science and technology to over 130,000 children and adults annually. For more information, contact Science Central at 260-424-2400 or visit on the web.